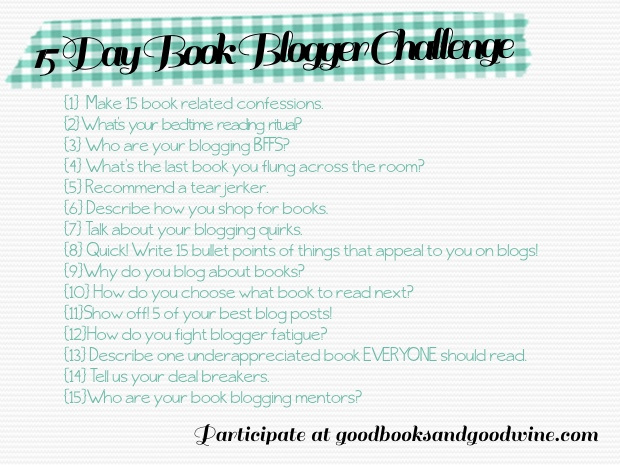 The 15 Day Book Blogger Challenge is hosted over at Good Books and Good Wine. We're back for day two, our bedtime reading rituals. By this time, it's usually pretty late, and then I either stop reading because I want to be a responsible adult, keep reading because omgthisbookissogood, or fall asleep on the book. 2. Lay down on the couch and open a book. 4. Wake up when the book smacks me in the face. Thanks for sharing this. It's a cool idea that I might have to copy and link back to. My nighttime ritual includes turning on the night lamp and turning off the overhead lamps too. I tend to get most of my reading done on lazy weekend afternoons and not so much at night but sometimes that ends up working out.